The 2011 chevrolet colorado regular cab electric vehicle qualifies for a federal tax credit of up to $7,500, effectively reducing the net base price. As penny-pinching is becoming the norm these days, the compact pickup is beginning to look mighty attractive. Though it can't tow or haul like a full-size Silverado, the 2011 Chevrolet Colorado makes an attractive alternative for those whose truck use tends to be more recreational than occupational. The Colorado's 185-horsepower four-cylinder and 242-horsepower five-cylinder engines provide good power and excellent fuel economy, while a four-wheel-drive option allows the compact pickup to tackle deep snow and venture off-road. For those seeking more power, a 5.3-liter V8 is available on Extended and Crew Cab LT models. Although the Colorado's cab and bed are not the largest in this segment (and its turning radius is uncommonly wide), the truck remains competitive with Ford's Ranger series and, to a lesser extent, the Toyota Tacoma, Nissan Frontier and Dodge Dakota. If you like the rugged, bold look of the full-size Silverado, but want it in a smaller package that gets better fuel economy, check out the 2011 Chevrolet Colorado. The standard four-cylinder engine is surprisingly strong yet, with two-wheel drive, is EPA-rated at 24 miles per gallon on the highway. 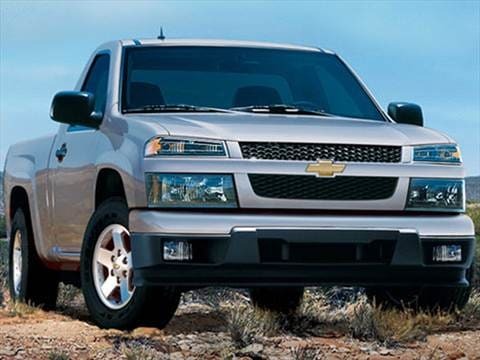 Some may find the 2011 Chevrolet Colorado too narrow and, with the Crew Cab model, short on rear-seat legroom. Also, the Colorado's optional 3.7-liter in-line five-cylinder engine does not offer as much torque as the V6 engines from Toyota and Nissan, while the V8 option tends to be a bit too fuel thirsty. For 2011, the Colorado receives newly designed front seat head restraints and the upgraded OnStar version 9.0. The 2011 Chevrolet Colorado's interior layout is highly functional, with all the gauges and controls in clear sight and easy reach of the driver. The seats offer firm bottoms and good lumbar support, and the cloth fabric is both durable and comfortable. Crew Cab models are a bit tight when it comes to rear-seat legroom, but front seat occupants should be more than satisfied. The one drawback may be the over-abundance of gray throughout the cab. Chevrolet recently revamped the interior color scheme to lessen this mass of gray plastic, but the most vivid improvements show up only in the pricier trim levels. Options include four-wheel drive, four-speed automatic transmission, power windows, power door locks, power mirrors, heated leather seats, automatic locking rear differential, tow package, 16, 17 and 18-inch wheel options, six-disc CD changer, traction control, Z71 off-road package, the ZQ8 performance package (18-inch wheels, sport suspension and 5.3-liter V8 engine) and Bluetooth hands-free phone connectivity. Engine choices for the Colorado include four- and five-cylinder powerplants, as well as a V8 engine on the LT trims. The standard 2.9-liter four- and the optional 3.7-liter five-cylinder engines might seem small, but they are both big on power. The 2.9-liter four-cylinder produces an impressive 185 horsepower and offers up most of its 190 pound-feet of torque between the ranges of 1,200 and 5,600 rpm. That's enough power to muscle any lightly-equipped four-wheel-drive vehicle through the toughest terrain. The optional 3.7-liter engine makes 242 horsepower. Both of these engines produce class-leading horsepower while returning good fuel economy. The big 5.3-liter V8 is powerful but not easy on gas and is best ordered only when towing is a priority. The Manufacturer's Suggested Retail Price (MSRP) for the 2011 Chevrolet Colorado ranges from just under $18,000 for a LS Regular Cab to about $24,500 for a Crew Cab LT. A fully loaded LT Crew Cab with four-wheel drive tops out at close to $34,000, while the base Regular Cab model can be loaded with options and still remain around $21,000. To help make your best deal, be sure to check the Fair Purchase Price. It shows what the Colorado is typically selling for in your area, a valuable piece of information when negotiating. As for resale potential, the Colorado falls far short of the values held by the Toyota Tacoma and Nissan Frontier. Kelley Blue Book expects the Colorado to retain less-than-average residual values. However, the Colorado matches the projected residual values of the Ford Ranger.